Gaurav Gulati, a Delhi-based lawyer, filed a police complaint seeking legal action against Radhe Maa for making "mockery of the law". A photograph of Radhe Maa showed her seated on SHO's chair and the officer standing next to her. 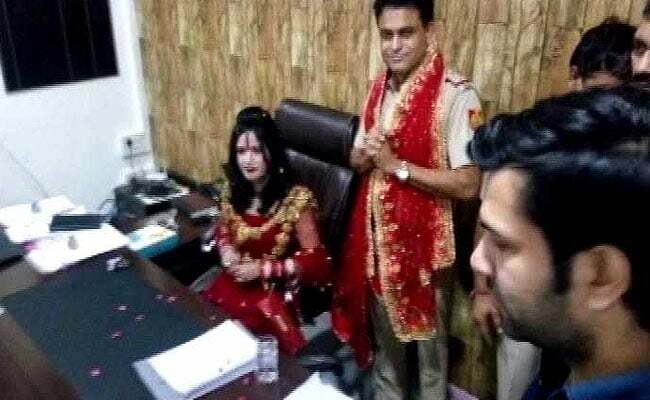 New Delhi: A lawyer has filed a police complaint against self-styled godwoman Radhe Maa for sitting on the chair of a SHO in an east Delhi police station and "insulting" the police fraternity. "Radhe Maa is liable for criminal conspiracy/ criminal trespass/ defamation and also liable to spoil the image of Delhi Police nationwide," Gulati said, adding her act shows that she has no respect for law and order. Earlier on October 5, an inquiry had been ordered into the "unprofessional conduct" of Station House Officer (SHO) Sanjay Sharma of Vivek Vihar Police Station and he was told to report to the district Police Lines till the inquiry got over. A photograph of Radhe Maa, reportedly taken on September 28, showed her seated on Mr Sharma's chair and the officer standing next to her with folded hands. Mr Gulati in his complaint said that the SHO was suspended but no action has been initiated against Radhe Maa, who entered the police station with "an intention to annoy and insult" the police officials. "Radhe Maa is a controversial character and always in news for her wrong acts and this time she has crossed all the limits of morality. Even if it can be presumed that she was allowed to sit on the seat of the SHO, it does not minimise her offence," the complaint read.